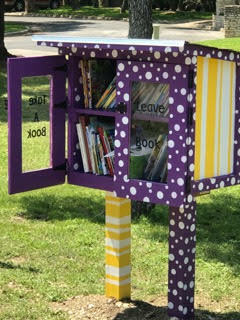 Grace Lutheran Church is an official site for the Little Free Library. It is located in front of the Wernecke Grace House. Books are available to all who pass by our property. Take a Book…Leave a Book is the theme of the library. If you take a book, you can return it or share it with others. It does not need to be returned to the library. If you have a book to share, you just place it in the library. Currently books range in age from infant to 5th grade. We are excited about this new adventure at Grace. The ELCA’s Facebook page recently celebrated a milestone of 108,000 followers! Have you liked our page? Join thousands of other Lutherans by engaging in this ministry of social media. We are church together! Find news, stories and photos from the ministries of the ELCA at Facebook.com/Lutherans.Quilting & Fellowship: 2nd Saturday of each month.